Robert Axelrod has carved a career in show business that runs the gamut. Born and raised in New York City, he did commercials and theater as a child and teen, eventually ending up in the Soho Avant-garde Theater scene in a show called "Little Trips", then Off-Broadway in a play called "The Destroyers". Axelrod left acting for the world of music. He spent eight years as a working rock musician playing electric bass and singing in folk, rock, and soul bands. Music brought him to Los Angeles where he decided to return to acting, a decision he never regrets. Since then, Mr. Axelrod has appeared in over thirty feature films including four with Charles Bronson, the Sci-Fi hit remake "The Blob" with Kevin Dillon and many others. Television appearances include guest star roles on "Amazing Stories", "Star Trek Voyager", "Tim And Eric's Awesome Show", and "The Mighty Morphin Power Rangers. He also starred in the Michael Jackson music video "Stranger in Moscow", and the horror dark comedy, "The Revenant". His performance in the short film THE GOLDFISH is garnering rave reviews. Mr. Axelrod is also a busy voice over artist. 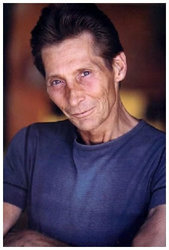 He is the voice of Lord Zedd and Finster on the "Mighty Morphin Power Rangers". The Lord Zedd voice is one of the most recognizable character voices around. He voiced Armadillomon and Wizardmon on "Digimon, Microchip, The Punisher's sidekick, on "Spiderman", Rico on "Robotech", and has voiced countless Anime features including "Akira", "The Big O", "Cowboy Bebop", "Brain Scratch", et al. As Lord Zedd, he starred in both the first Power Rangers feature film and the wildly popular live show that toured the country. He was a regular character on Saban Entertainment's "Wowser" series (as Ratso Catso), "Journey To The Heart of the World" (as Scarface), "Hallo Spencer" (as Elmer), and more. He just finished narrating the mockumentary "Safety First: The Rise of Women and voicing four Anime series, "Gaiking", "Danguard Ace", "Captain Horlock", "The Adventures of Nadja", and "Fist of the North Star".